KEAAU – The King is back! Kau’s Jacob Edwards, a.k.a. 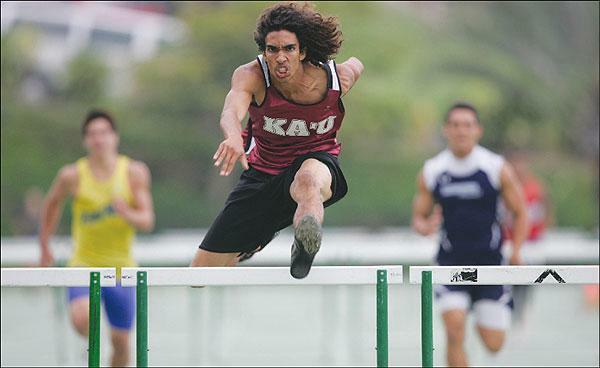 “The King of the Hurdles” returned to the track this past Saturday at Kamehameha for the first time this season and showed why he is the best in the state. In his first event since straining his hamstring two weeks ago Edwards dazzled the crowd with his perfection, speed and grace in the 110-meter hurdles to win in a state best time 14.48 seconds. 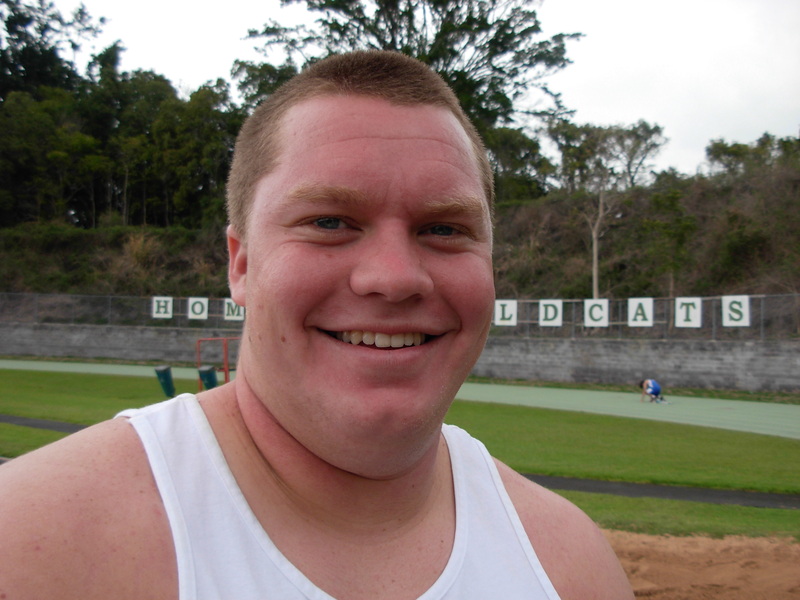 In the process Edwards also eclipsed his own Paiea Stadium record set in 2009 of 14.85. 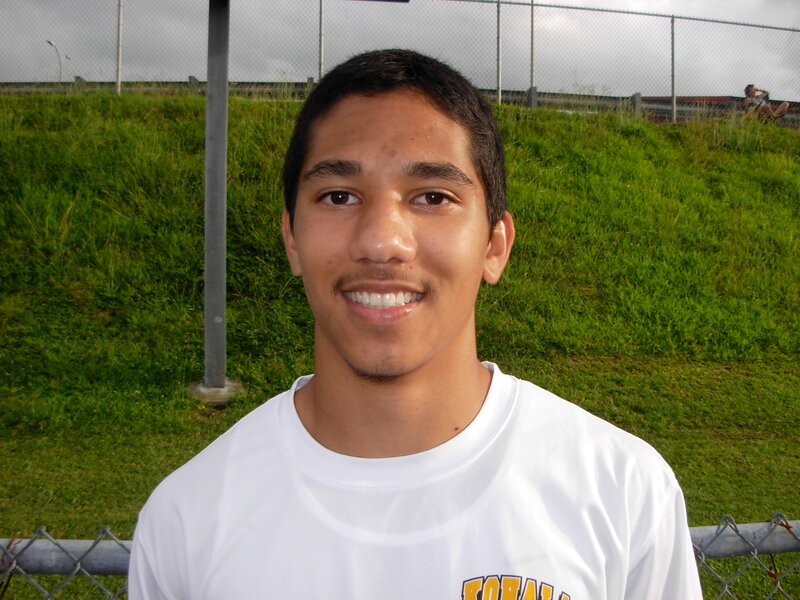 Edwards is the defending state champion in both the 110 and 300 meter hurdles and looked to be in peak performance as he reclaimed the top times in both events in the state. 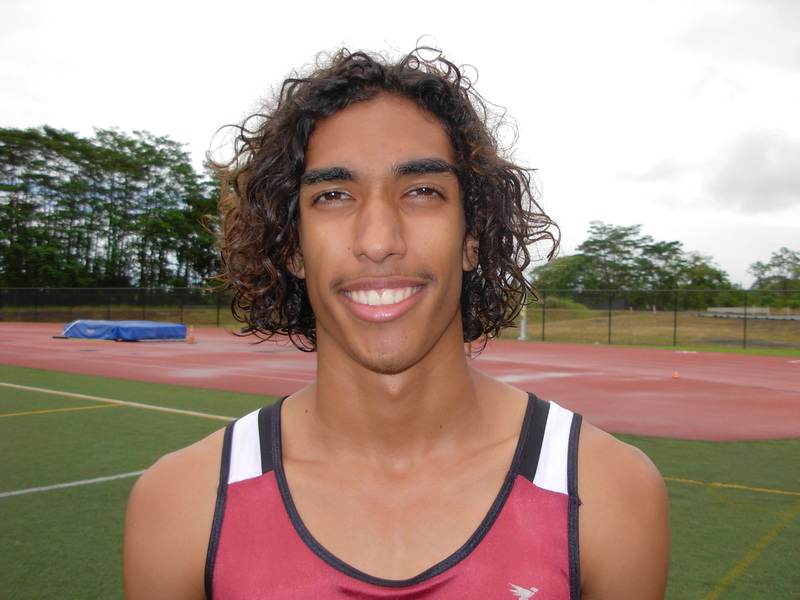 During the 300 hurdles Edwards blasted out of the blocks, like a rocket, and distanced himself from a talented field of athletes to glide, effortlessly and win in 39.24 seconds breaking Kekoa Chavez stadium record of 40.28 set in 2005. After his record setting day Edwards was all business as he analyzed and critiqued his performance on the track. “I need to work at getting a better start out of the blocks as I wasn’t happy with my 110 start,” he said. “I hope to improve and I think I can go faster in both events. The Trojan super star was also busy making state qualifying distances in the long and triple jumps. Edwards Leaped 21’ 2.25” for second place in the long while hitting 44’ 1.5” claiming first place in the triple. 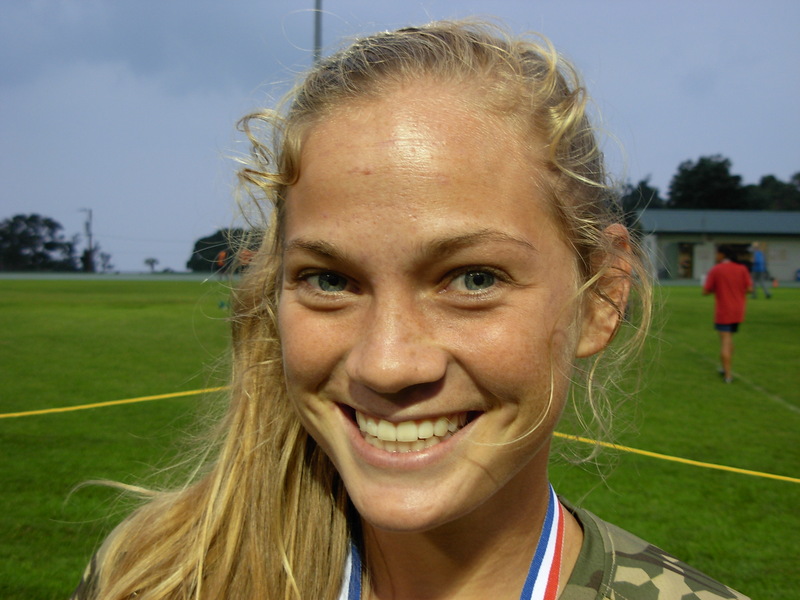 While Edwards was making his Big Island Interscholastic Federation season debut Kamehameha’s Kana Silva was making a debut of his own. The Warrior senior, who is best known for his running back skills on the football field, made his first ever appearance in the 100 meter dash. With over 70 boys entered in the 100 seeding officials broke the large group into 9 heats with those like Silva, who had not logged an official time, going in the earlier, unseeded heats. Running in the second heat Silva disappeared from his competition right from the start and crossed the finish line well ahead of his heat in a BIIF best time of 11.13 seconds. 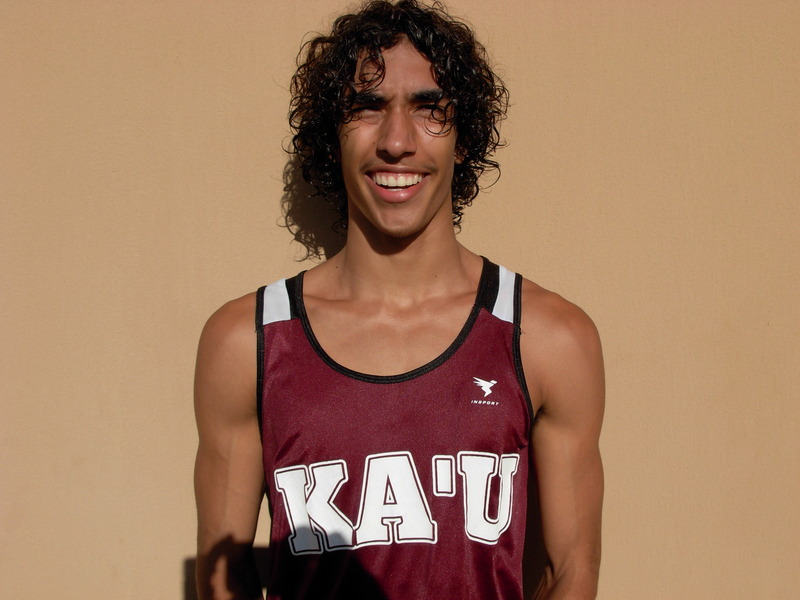 The closest times in the league came from teammate Kaenen Akau who clocked 11.30 and Keaau’s Jesse Huihui at 11.31. 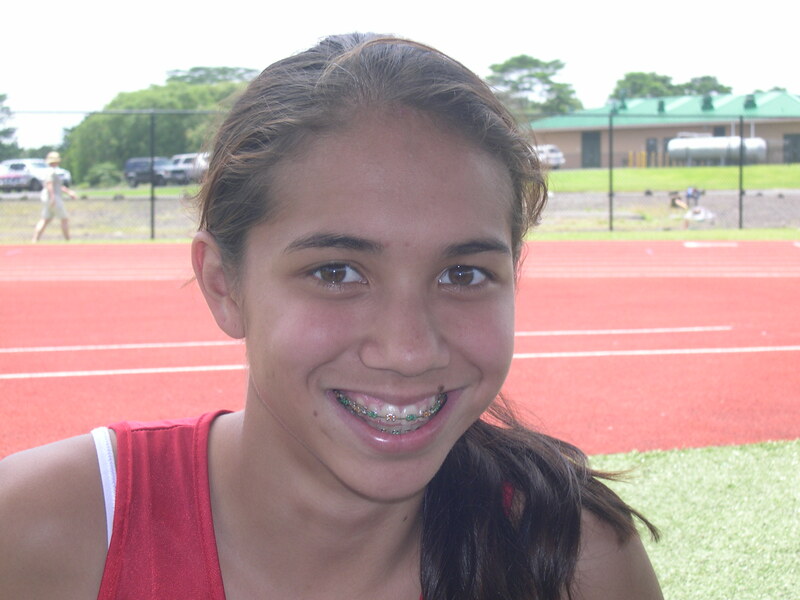 “I didn’t run track last year and during the first two weeks of the season I was playing rugby for the Hilo Reign,” Silva said. With two of the fastest sprinter in the BIIF in Silva and Akau the Warrior 4×100 relay team ran a winning 43.92 second state qualifying time beating a good Keaau squad by nearly 2 seconds. Silva was to run in the 200 meter dash later in the day, but during his long jump effort strained his hamstring and decided to sit out the rest of the day’s competition. 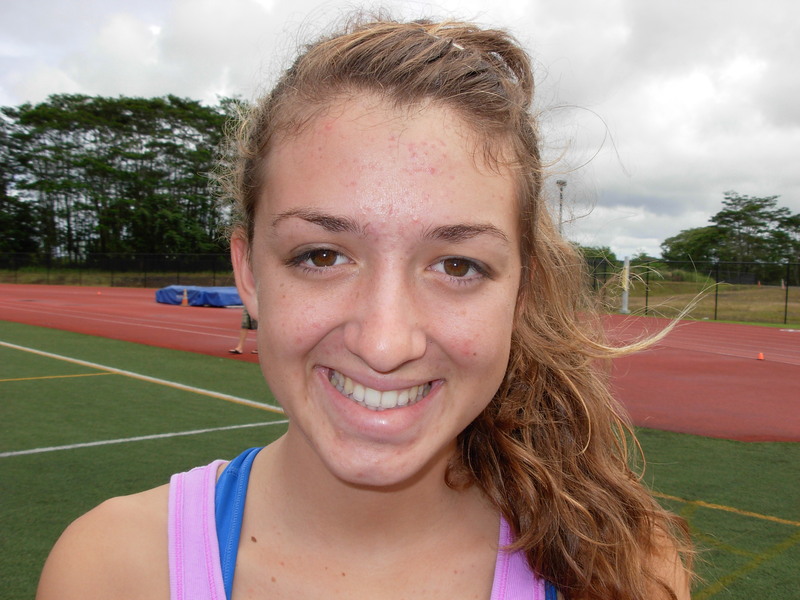 The Hawaii Prep senior has turned everything she has entered into gold and the big surprise on Saturday was when she entered the 100 hurdles, an event that she has never tried prior to two weeks ago. 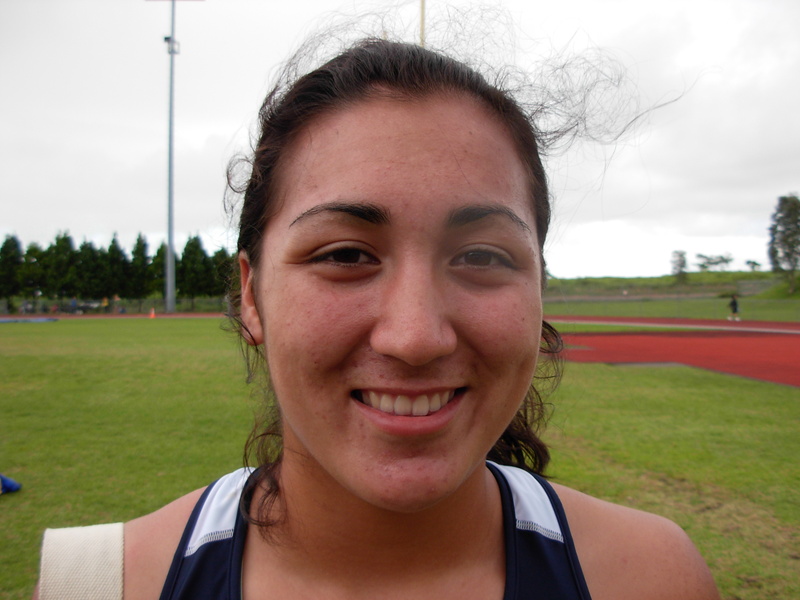 At Kamehameha on Saturday it was Nakoa winning the 100 hurdles in a state qualifying time of 16.10 seconds. 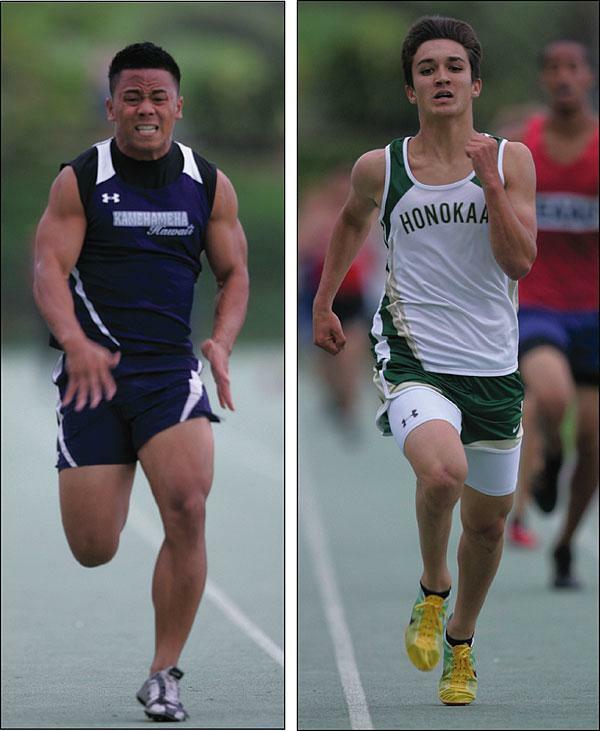 A week earlier, at Konawaena, Nakoa ran 15.6 seconds and is currently ranked number 2 in the state for that event. 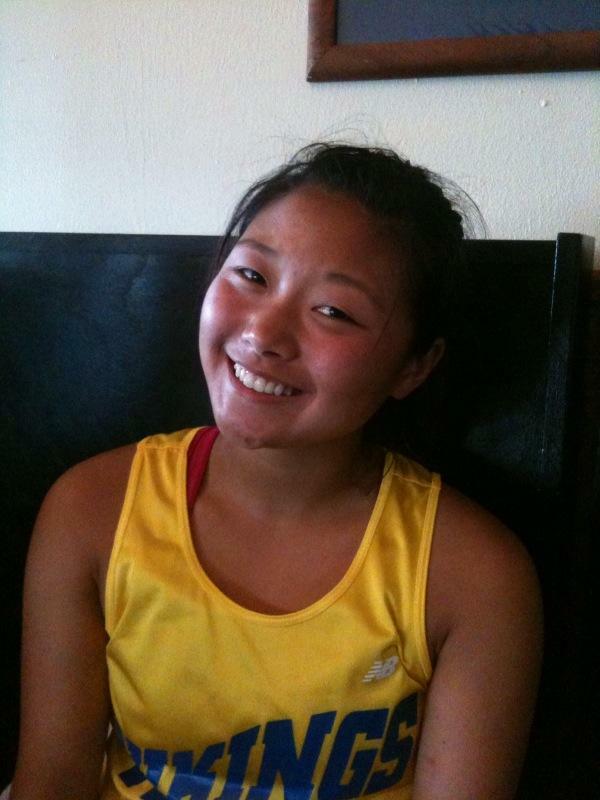 “I don’t practice hurdles and I know I need a lot of work,” she said after the meet. Nakoa, the state champion in the long jump, currently has the best distance at 18 feet and is listed as number 2 in the state for the triple jump when she leaped 35 feet 10 inches on Saturday. 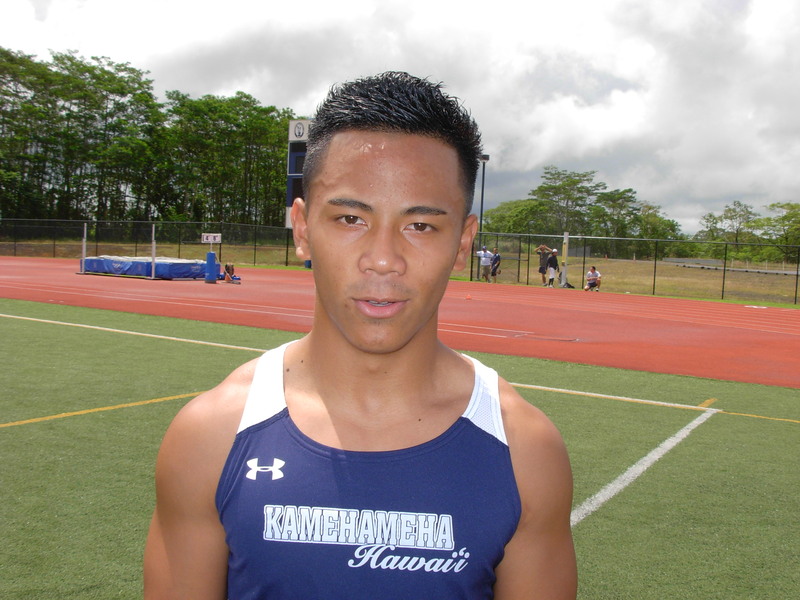 The multi talented Ka Makani is also ranked #6 in the state for the 100 meter dash and #11 for the 400 dash. “I’m trying to decide what to focus on as I know I want to do the long, triple, 100 hurdles and 100 dash, but I need to decide between the 300 hurdles and 400,” Nakoa said. 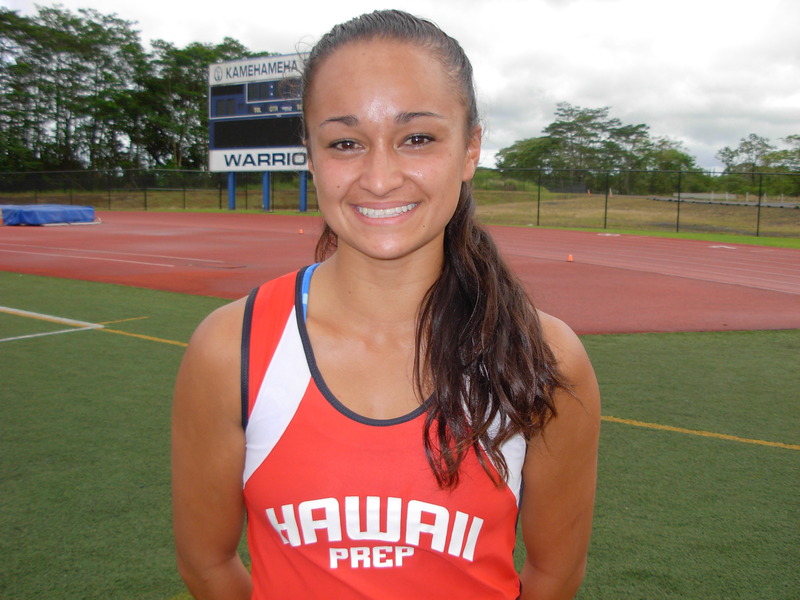 Ka Makani teammate, Mindy Campbell, the defending state high jump champion has been consistently jumping at 5’ 2” and higher all season. Campbell is currently ranked #1 in the state with a height of 5’ 4”. “I hoping to go 5’ 6” and I’ll work on altering my approach,” she said. 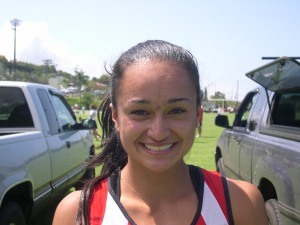 The BIIF regular season continues this Saturday with an all-schools meet at Konawaena. The meet will being at 9:15 a.m. with the girls and boys 3000 meter run.